As we discussed earlier, not all business or first class seats are worth spending miles and efforts. In the last few years, airlines have done a great job designing new aircraft and retrofitting the old ones with swankier-than-ever premium class seats. Of course, the mile price of these seats is also higher than ever, but it’s still be a great deal, especially if you are embarking on a major trip and eager to arrive rested and ready to enjoy your destination right away. Unfortunately, it’s not always easy to decipher whether or not you’re going to fly on the “right” equipment. It might sound strange that airlines don’t widely advertise their premium product. 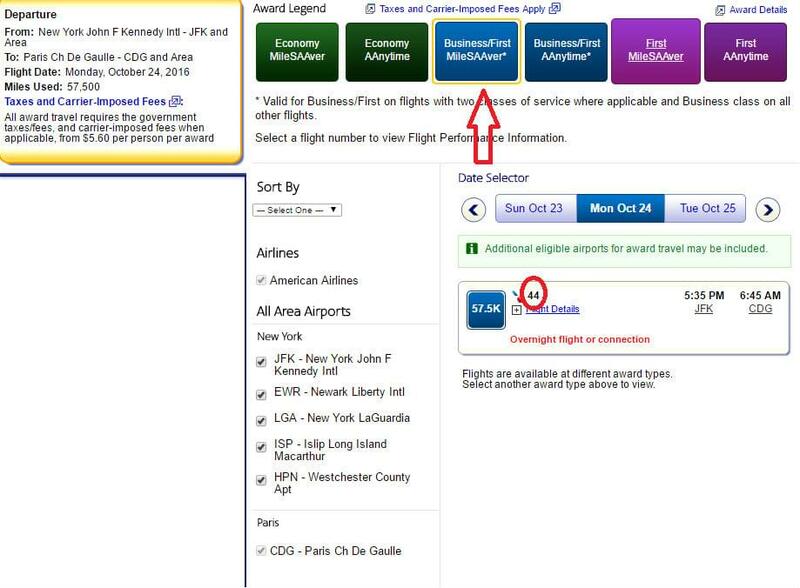 One of the reasons might be as simple as ineptitude, but this scarcity of information might also be attributed to the ways airlines do business. Since your airline ticket is merely a “contract of carriage,” the airline wants to have maximum flexibility and be able to switch the planes at a moment’s notice. Since not all aircraft have these relatively new fabulous features, they might not want to over-promise and under-deliver. In any case, the task of making sure you’re getting the best possible seat lies squarely on your own shoulders. Fortunately, we can help. American flies its retrofitted three-class planes on two routes: New York (JFK)–LA and New York (JFK)–San Francisco. You need to make sure that you have a non-stop flight, otherwise you will waste your miles on an old recliner seat. The cost is 32,500 miles in business and 50,000 in first one-way. Both cabins feature lie-flat seats. Read more about these routes here. Asia 1 (Japan, Korea): 60,000 in business, 80,000 in first one-way. Asia 2 (elsewhere): 70,000 in business, 110,000 in first one-way. American is not big on Asia. It only flies to Beijing, Shanghai, Seoul, Tokyo, and Hong Kong. However, that doesn’t mean that you can’t get wherever in Asia you’re going. American partner Cathay Pacific will take you to most destinations in Asia from or via Hong Kong, while another oneworld partner, Japan Airlines, will do the same from or via Tokyo. It will increase the number of your connections, but there is a good chance you can get wherever you want if you get that first and most important flight from the U.S. So what are the best options to get there in comfort? All American Airlines three-cabin Asia-bound planes feature lie-flat seats in first class. 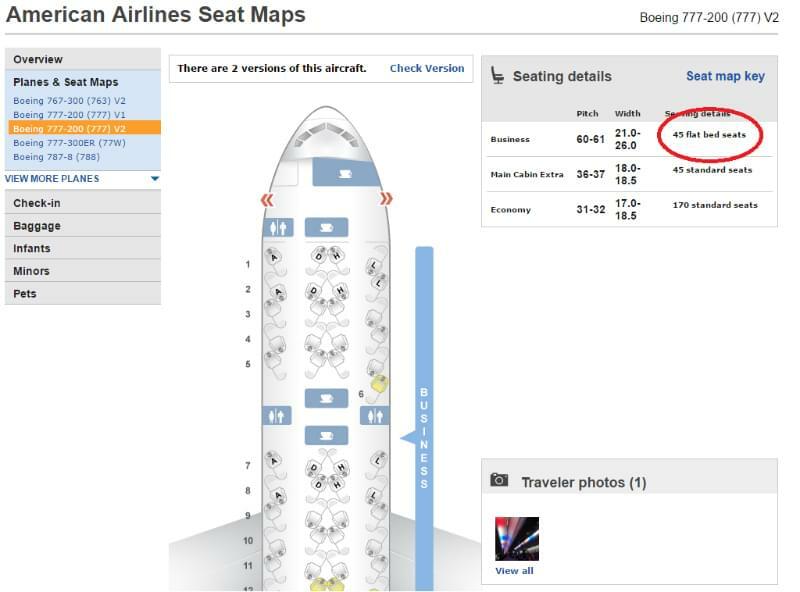 The problem is that after the recent devaluation, that first class seat has become crazy-expensive – 220,000 miles to Asia 2 for a round-trip ticket. The business class at 140,000 miles is more reasonable, but most of American’s business class seats are angle-flat, which is not as comfortable as the real thing. There are, however, some notable exceptions. The Dallas–Hong Kong route is served by a 777-300, a 3-cabin aircraft with lie-flat seats in first and business. Dallas–Beijing and Dallas–Shanghai are served by a 787 Dreamliner, a 2-cabin plane with lie-flat seats in business. Chicago–Tokyo and Chicago–Beijing are also served by a 787 (same configuration). Europe and South America: 57,500 miles in business, 85,000 in first, one-way. Flights between New York and Sao Paulo feature a 777-300ER, a new 3-cabin plane with excellent configuration (lie-flat seats in first class and business). Unfortunately, first class availability can be abysmal on this route. New York–London, New York–Barcelona, New York–Rio, and New York–Buenos Aires: 777-200 (2-cabin, lie-flat in business). In January 2017, American will begin flying a 3-cabin 777-200 between New York and Barcelona, with lie-flat seats in first class and angle-flat seats in business. New York–Paris and New York–Zurich: 767 or 777 (2-cabin, lie-flat in business). 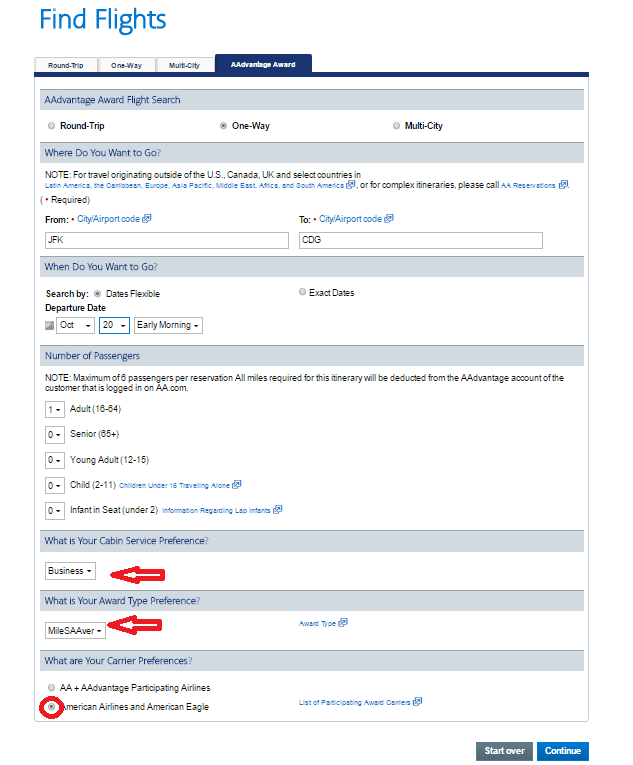 Go to AA.com, enter your parameters and click Advanced Search. Check American Airlines and American Eagle, make sure you picked Business, and click Continue. Change to Non-stop Only, and again make sure to click Business, then pick the date that works for you if your date is unavailable. Click Continue. Note the flight number – in our case it’s 44. 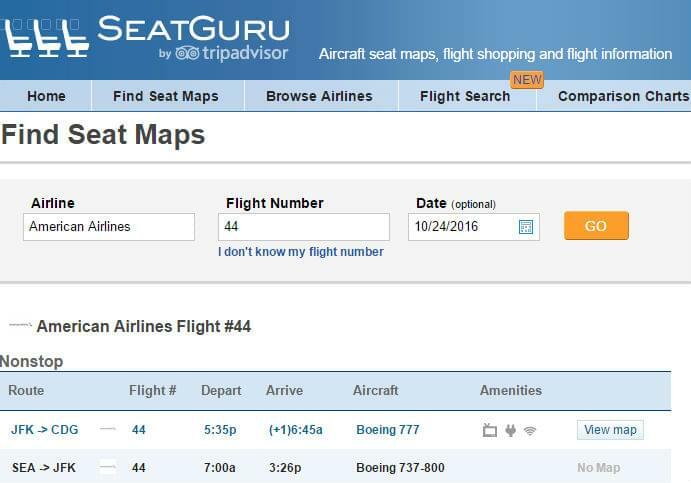 Open seatguru.com and enter your flight’s information, then click Find Seat Map. Make sure the information is correct and click GO. Make sure the plane features the type of beds you’re looking for. Please remember, though, that no matter what we do, an airline always has the right to change the equipment without notice. Fortunately, it doesn’t happen very often.